Visual content helps marketers communicate smoothly and effectively with their audience. And nothing demonstrates the impact of visual content in marketing better than the continued popularity of infographics. In a recent trend analysis on visual content, HubSpot found that infographics are liked and shared on social media 3 times more than any other type of content. Furthermore, readers spend more time looking at the images than they do reading text on the page. In short, infographics can help you get more page views, social shares, and as explained in this guide, boost your SEO by helping you generate authoritative backlinks. So how do you go about creating infographics that are deemed share-worthy by your readers? The main challenge for non-designers is to create visually appealing infographics without hiring a professional graphic designer. To address this limitation, bloggers and solopreneurs often have to resort to sites like Behance or Upwork and spend tons of money to hire a graphic designer who can do a decent job. While this option certainly works for some people, it’s not the ideal path for people who’d like to create infographics in a cost-efficient way at a brisk pace. Besides, wouldn’t it be great if you had complete control over your design? This is where a design tool like Venngage is a blessing for non-designers. Venngage is an online infographic maker which lets you easily create infographics from hundreds of predesigned templates. It’s a highly popular design tool, used by marketing veterans like Sujan Patel, Brian Dean, Neil Patel, among others. Hence, I thought it’s about time we put this tool to the test. In this Venngage review, we’ll help you decide whether this is the right online infographic maker for you and examine the tool’s key features, pricing, and user reviews and sentiments around the product. Venngage uses the tagline ‘Free Infographic Maker’ in most of its communications, but to reap the benefits of this tool, you’d have to upgrade to one of their paid plan. These are the 3 main pricing plans that Venngage currently offers. Here’s a brief snapshot of what each plan includes before deep dive into the key features of each of these plans. You can save 12% by paying quarterly and 20% by selecting the annual payment option. In addition to these 3 plans, there is an education for students and teachers as well as a non-profit plan for non-profits and NGOs. 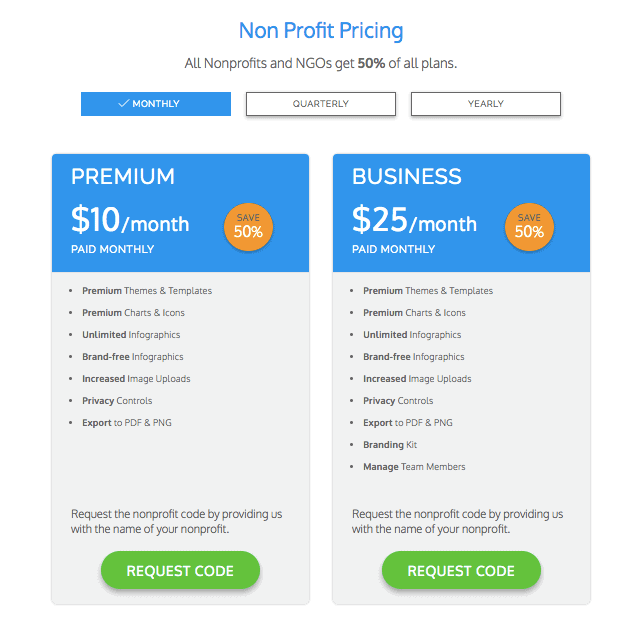 All Nonprofits and NGOs get 50% off on all plans. Now let’s examine each plan and see which one provides the best bang for buck. As you would imagine, the free plan has several restrictions. There are very few free infographic templates you can choose from and very little customization which is possible as you’re not allowed to upload any of your images. Moreover, you’ll not be able to use your logo nor will you be able to export the infographic. If this is your first time using an online infographic maker, then you should probably go with this plan as it’ll allow you to ascertain how user-friendly the tool is. 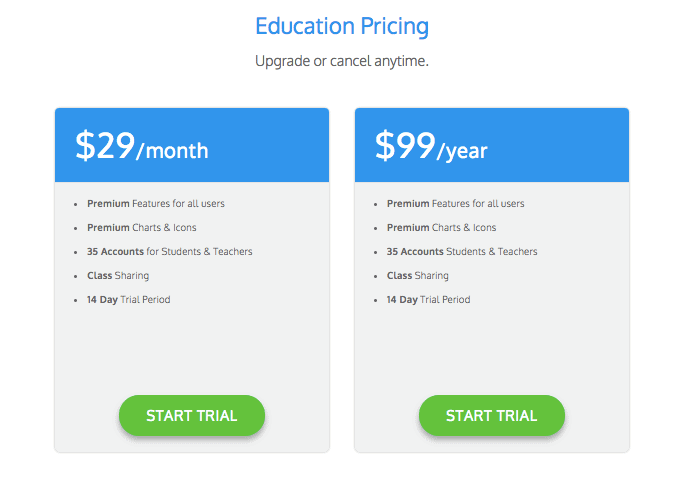 Once you’re confident about creating infographics using Venngage’s drag-and-drop editor, then it’s time to upgrade to any of the following paid plans. With the Premium plan, you can access premium templates, include your branding, export the file to PDF or PNG, and upload up to 50 images per month. You can also access hundreds of charts, maps, and icons and choose the perfect data visualization. In addition to this, you can look forward to new premium templates being added each week. This is the best plan that Venngage offers and understandably, the most expensive at $49/month. Venngage’s Business plan includes everything under the premium plan plus access to professionally designed business templates, charts, reports, flyers, brochures and social media images. Aside from exporting your files into high-res PDFs and PNGs, business members also have the option to export files in interactive PDFs, allowing you to insert hyperlinks. You’ll also receive priority support, which includes 1-1 consultations from Venngage’s team of designers, marketers and experts. Selecting a plan on Venngage will depend on your needs. If you publish 3-4 articles a week and would like to leverage infographics for each one of them, then you should probably go with the business plan. On the other hand, if you’re selective about the infographics you want to create, then the premium plan should suffice. The free plan, sadly, doesn’t offer much for serious bloggers and publishers, as there is no scope to include your logo or even export the file. But you can choose the free plan to learn the nitty-gritty of designing with the tool. Editing pre-existing templates should give you a fair idea as to how the design tool works and how much time you’ll need to create an infographic. Like any other online design tool, there is a learning curve involved with Venngage. There is a lot of similarlity between Venngage and other design tools like Canva and Piktochart. So if you’ve experience using these tools, then you’ll find it very easy to create infographics on Venngage. Choose a template: Sign in to your Venngage account and select a template that best suits your needs. Add charts and visuals: Visualize your data and information with charts and text. Enhance your infographic by adding icons and images from Venngage’s library. Customize your design: Make your infographic unique by applying your own style. Change the fonts and colors with the Venngage infographic maker. You can also visit the support center and search the knowledge base if you need assistance in designing your infographic. Here are some infographic examples from the Venngage gallery. Venngage is well-loved by entrepreneurs and bloggers. You can find a few testimonials on their site from influencers like Sujan Patel from Mailshake and Nathan Chan from Foundr. There are not too many reviews of Venngage on review platforms. Having said that, the few reviews that the tool has received are highly positive. On review site G2Crowd, Venngage is rated 9.4/10 from 18 reviews. It’s worth noting that Venngage is a relatively new tool compared to other design tools such as Canva and Piktochart which have had more time to establish a reputation among bloggers and solopreneurs. Once you start using Venngage, you’ll understand why it’s so popular among marketers. It’s easily the best online infographic maker and also the most easy-to-use design tool you can find to create drool-worthy infographics. With hundreds of predesigned templates and new ones added each week, you can create infographics that people love. Stop wasting time and money on freelance sites and start using Venngage. Trust me, you won’t be disappointed! Venngage is easily the best online infographic maker and also the most easy-to-use design tool you can find to create drool-worthy infographics. If you're serious about creating high-quality infographics that your readers will love, then Venngage should be your go-to design tool.